For some Boston Public School students, science class is a 20-minute ferry ride away. If your middle-school science class is studying New England’s green crab population, chances are you’ll get a lot more excited about the origin, life cycle, and environmental impact of this remarkable invasive species if the lesson plan includes a trip to an island where you can catch and hold one of the briny little creatures in your own two hands. Since 2005, Pearson has spearheaded an $8.3 million capital campaign to fund infrastructure upgrades in the nonprofit’s dormitories, laboratory, instructional space, dining hall, and challenge courses. The funding will also support the expansion of the organization’s programs, which include science education, character development, and summer learning opportunities that touch the lives of 6,500 adolescents annually. A key initiative is Connections, a multiyear, experiential learning program for urban middle schoolers. 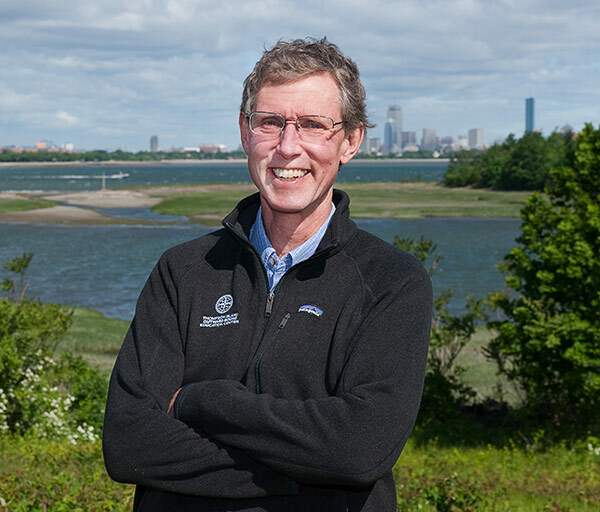 “We’re building partnerships with Boston public schools to bring students in grades five through eight out to the island for hands-on science education,” said Pearson, who was honored in 2015 by Boston’s Barr Foundation for his outstanding contribution to the community and potential to drive change for years to come. When fully implemented, Connections will allow 2,600 students from eight to 10 schools to participate in a sequential, four-year curriculum of island-based learning modules that satisfy state science standards and develop leadership and ambition for a career by practicing real science in an inspiring natural environment. Evaluations to date show that students who complete Connections modules have a better grasp of academic principles; and feedback from Boston teachers indicates that the program is helping students to achieve academic and social-emotional growth. Pearson has been associated with Outward Bound for the better part of four decades, either as a field supervisor, program director, or trustee. “I started with the Hurricane Island program in Maine in my freshman year at Dartmouth and never looked back,” said Pearson, who was in his 30s and working as an administrator in the organization’s Baltimore office when he decided to enroll at HBS. “I wanted to take a stab at for-profit management, if only to get a better understanding of the mindset of the trustees and board directors I worked with at Outward Bound,” he explained. However, during a “fascinating, intellectually engaging, intense, and ultimately life-changing” two years at HBS, Pearson unexpectedly “fell in love” with the economics of deregulation, a passion that led him to a 14-year career in the New England power industry, where he played a key role in building a start-up company into a $300 million energy marketing enterprise. 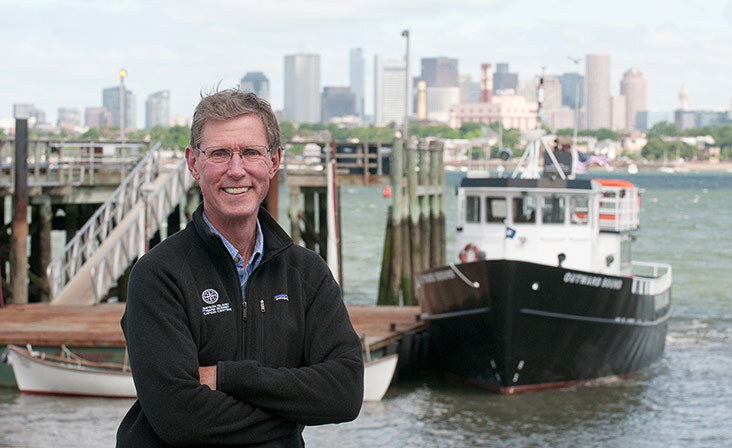 When he rejoined Outward Bound full time at Thompson Island in 2005, Pearson stepped into a situation that immediately challenged the management skills and perspectives he had acquired during his extended hiatus. Located just a mile from Boston and part of the Boston Harbor Islands National Park, Thompson Island has been committed to disadvantaged youth since 1833, when a group of Boston philanthropists established a farm school there to provide housing and practical education for orphaned and at-risk boys. Outward Bound’s influence on the island began with when it launched its first adventure learning and character development programming in the mid-1970s. The island became formally affiliated with Outward Bound USA in the late 1980s. When Pearson arrived on the scene, Outward Bound was running an independent middle school for boys on the island as well as hosting week-long expeditions for Boston public school students and teachers, focused on confidence building, problem solving, and commitment to diversity and social justice. Fortunately, noted Pearson, “Some of the seeds of our current success had already been planted.” Specifically, there had been increased emphasis on environmental education programming based in field science on the island and a concerted effort to develop the island’s appeal as a site for corporate conferences, weddings, and other income-generating events. Also in the center’s favor were a growing push in the United States to make science education more experiential as well as a series of studies by the National Research Council that emphasized the success of programs that paired classroom learning with hands-on learning at museums, zoos, aquariums, and outdoor education centers. While Connections is the center’s flagship program, the organization also offers a variety of programs for Boston youth and school organizations, including adventure-based programs for schools and community groups, internships for teens with career ambitions in the green job sector, and year-round professional development and corporate team-building programs. Pearson says he and his colleagues are guided always by “what is the highest and best use of this amazing resource in the service of Boston’s young people.